Black fronted terns at Palmer Head/Wahine Memorial Park, Miramar. Just east of Tarakena Bay on the very tip of the headland there is a big roost of white fronted terns numbering some hundreds. There are also half a dozen black fronted terns which tend to stay as a bunch at the edge of the main group. One of them is banded. Did you perchance see any leg flag on it? I have checked all my photos and only one was banded. No flag. 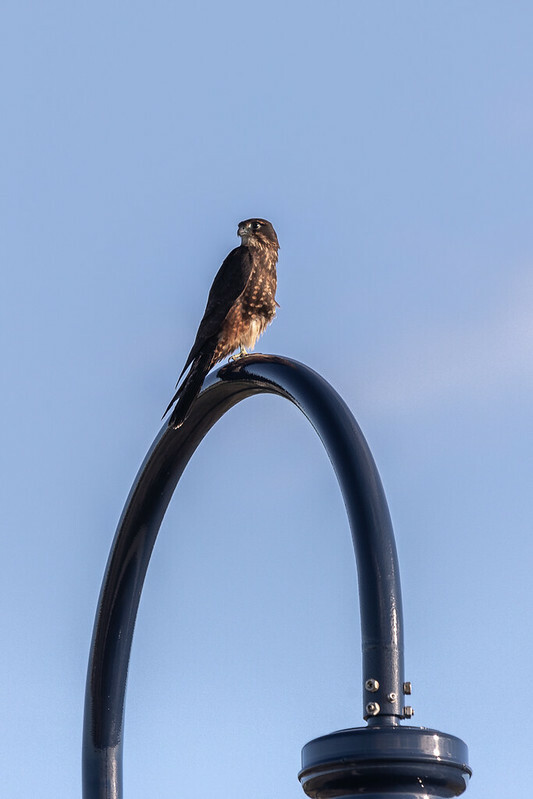 I had a great close up view of a Falcon at Seatoun beach on Thursday. I was getting ready for a late afternoon swim, and standing at the carpark above the beach. The bird flew past at eye level, about ten metres away, briefly harassed but unperturbed by a smaller bird. It flew low over Ferry Street and the houses beyond. Pushing the limits of Wellington a little here. 3 times over the past week or so I've seen a single falcon in Porirua. Once flying over the motorway opposite the Porirua train station carpark, once flying over Jasmine Underhill Reserve in Aotea and this last Sunday at the top of the newly opened roads in Aotea. Just a youngster, perhaps searching for a new territory in the vicinity of Bothamley Park.